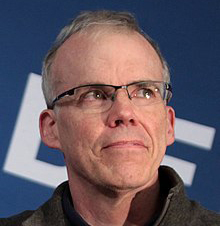 BILL McKIBBEN, environmentalist, author, and journalist who has written extensively on the impact of global warming. He is the Schumann Distinguished Scholar at Middlebury College and leader of the anti-carbon campaign group 350.org. He has authored a dozen books about the environment, including his first, The End of Nature (1989), about climate change.